← #RandPaul: My 1.6 gpf toilet takes (at least) 3.2 gallons to do its job. One area where we have focused our efforts since the start of the administration – long before this current spike – is increasing responsible domestic energy production – including oil and gas. In fact, oil production last year rose to its highest level since 2003. 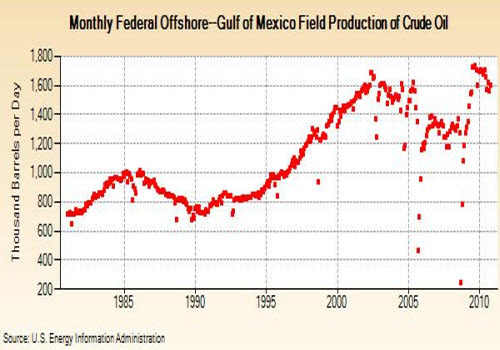 From 2008 to 2010, oil production from the Outer Continental Shelf increased more than a third – from 446 million barrels in 2008 to an more than 600 million barrels of estimated production in 2010. Oh, my gosh. I have been paying attention, guys. It was very clear from day one that the Adminstration’s focus was on renewables, not oil and gas. The political appointees in the Minerals Management Service, from erstwhile Director Liz Birnbaum down, had no previous oil and gas background. They were environmental lawyers. I saw Interior Secretary Salazar speak in New Orleans, early on in 2009. He had just cancelled the Five Year Leasing Plan for the Offshore that his Republican predecessor, had only recently approved. That Five Year Plan is still in limbo. No, two things stick with me from Secretary Salazar’s meeting: he was interested in increasing the Federal Government’s revenue by increasing oil and gas royalties, and he was interested in advancing offshore wind energy. The President’s first budget proposal in 2009 proposed increasing the tax burden on the domestic oil and gas producer. It is categorically true that, while the numbers may be factual, Obama Administration policies had nothing whatever to do with the production buildup in late ‘09 into early 2010. …”First oil” came on June 14, 2008. Since then, Thunder Horse has steadily ramped up its production by bringing on new wells. In March 2009, Thunder Horse produced close to 250,000 barrels per day (40,000 m3/d) oil equivalent in oil and natural gas from seven wells. In any case, the oil and gas industry actually delivers innovation via the free market. The Obama Administration’s promised Hope and Change, by contrast, depends on a central planning model which is a proven failure. Government policies cannot keep up with, much less predict, the quality and the potential impact of the creativity of private capital. It is especially outrageous that The White House tries to glom the credit for private success.